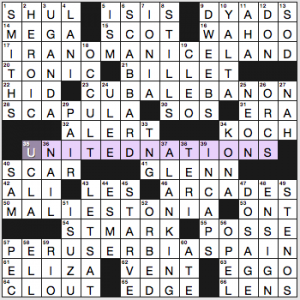 The puzzle seems ill-timed, since UNITED NATIONS is clued as 35a. 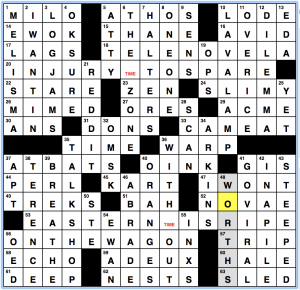 [Organization honored on October 24 … and the theme of this puzzle]. Why mention the date for UN Day if the puzzle’s not running then? Lots of other ways to clue the term. Anyway—the theme answers are goofy phrases cobbled together by combining the names of countries, and then splitting them into different words. 17a. [“You can’t bring in a crazed antelope, Mr. Glass!”? ], “IRA, NO MANIC ELAND!” Iran, Oman, Iceland. 23a. [Wrigley Field’s beer boycott goes into effect? ], CUB ALE BAN ON. Cuba Lebanon. 50a. [Mother isn’t straight with actress Vardalos? ], MA LIES TO NIA. Mali Estonia. Nia Peeples and Nia Long, sorry. We know you’re both appearing on screen more often these days than Vardalos is. 57a. [Suffering caused by reader prejudice? ], PERUSER BIAS PAIN. Peru Serbia Spain. Nobody much uses PERUSER as a word. I find myself wishing the UNITED NATIONS revealer had been scrapped, loosening up the grid so that it doesn’t include so much clunky fill. ORBED (52d. [Spherical]) is perhaps the worst offender. I do like IN CAPS, though. Does seem mildly odd to have UGANDA in the fill, given the theme. I enjoy geography-related themes, but the fill detracted from that wordplay today. Proper nouns in the grid: ISIS SCOT KOCH GLENN ALI LES STMARK ELIZA EGGO SAM UGANDA RIO LANI ISUZU ULEE (!) ESME IONIA TNG ALANKING CLEO TERI YALTA KONA OPEL. What is that, 24? That’s way too many for the sake of the solvers who aren’t keen on puzzles that quiz them on names. 51d. [Japanese import], ISUZU. Guess what? Isuzu no longer makes passenger cars and SUVs, but they do make a few pickup trucks along with commercial vehicles. 9a. [Couples], DYADS. Oh, hey! 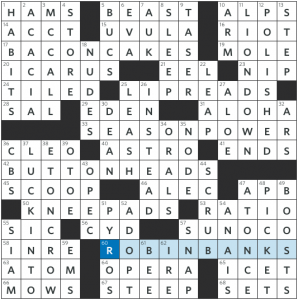 I missed DYAD in Tuesday’s NYT Spelling Bee puzzle. I’m up to 48 words, 172 points. Still plugging away with Gareth, pannonica, and P.D. 2.75 stars from me. Without the revealer jacking up the theme density, I think I’d have enjoyed this puzzle a lot more. Certain gerund-including phrases have that final G elided, thus forming sound-alike words. The corresponding made-up phrases get the wacky treatment. 17a [Patissier’s pancetta desserts?] BACON CAKES. Baking cakes. This base phrase doesn’t feel as strong idiomatically as the others. You may debate the value of putting bacon inside cakes. 33a [Leader in the pennant race, say?] SEASON POWER. Seizing power. 42a [Forepersons at fastener factories?] BUTTON HEADS. Butting heads. Meh. This entry doesn’t have much surface sense. 60a [Where early birds deposit their worms?] ROBIN BANKS. Robbing banks. Not bad. I like the imaginative clue. 11d [Filler for a pride parka?] LION DOWN. Lying down. Not the kind of “pride” I was thinkin’ of. I’m not sure how you get down from a lion, but I don’t mind the entry. 38d [Avian mascot of a British school?] ETON CROW. Eating crow. This one works best, in my opinion. The base phrase is colorful and the entry itself has good surface sense. Although I hardly think a school as prestigious as Eton would have a common crow as its mascot. Still, good entry. LUCK INTO, LIP READS, and KNEEPADS make for fine non-theme fill. I also like seeing ICARUS and ACACIA. I could really do without longtime crossword staples OTOE and INRE. 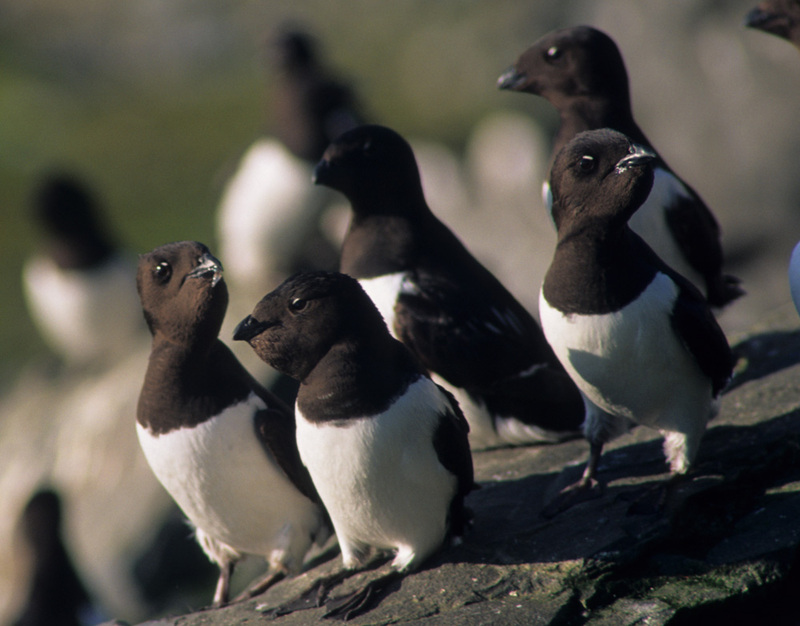 The little AUK I don’t mind. It’s cute! For the clue [Chow line?] and the entry looking like LE_S_, I wanted LETS(EAT) with the EAT rebusized. But the clue is referring to dogs to get the answer LEASH. [Its newest member is Congo] clues OPEC. I heard yesterday that Qatar is leaving OPEC to focus on natural gas production. That’s all I have. 3.25 stars. Four theme answers have a fire related word: BURN, FLAME, FIRE and BLAZE. Two of the four theme answers don’t seem to be real things. A FACIALBLAZE is just called a blaze. Googling “facial blaze” +horse gives you three-hundred odd hits the third of which is for this puzzle… FLAMETROLLING Googles slightly better, but for an internet phenomenon, not well at all. Pretty sure this is describing either FLAMING or TROLLING and putting them together like that is not a special thing. Each rebus square featuring TIME acts as a warp – INJURY TIME OUT starts in 20A and finishes at the end of 36D, EASTERN TIME ZONE starts at 53A and ends at 6D, and THE TIME IS RIPE and WITH TIME TO SPARE complete the down entries in similar fashion. The construction on this, given the constraints, is pretty fantastic! Nicely done, Erin. This entry was posted in Daily Puzzles and tagged Alan Arbesfeld, Daniel Hamm, Erin Rhode, Mark McClain, Mike Shenk. Bookmark the permalink. AV Club: Nicely bizarre and orthogonal (sort of). Great work. 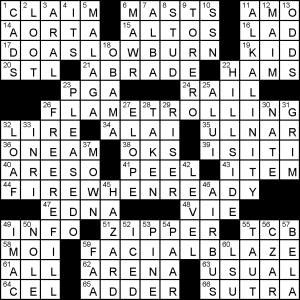 NYT: I agree that there were too many proper names, sometimes in the same corner, which detracted from the puzzle. But I needed that revealer (may be clued differently). I was getting stuck here and there until I got to it, and then everything fell easily. I wasn’t unhappy about the NYT. I actually enjoyed the challenge of both getting the country names and then parsing them into a phrase that fit the clue. WSJ re: “Bacon Cake” I bet they’d love that in Portugal. They put meat, especially ham and pork in so many dishes. They even bake it into bread. They love their meat. re: “Eton Crow” Crows are not that low a form of life; they’re actually quite smart at least as birds go. I’ve seen documentaries in which they have made tools for themselves such as bending a wire so as to reach a piece of food they couldn’t get at otherwise. Agree 100%. Superb puzzle despite the Natick. I feel like I heard 1-down at least once on an episode of American Idol when the judges were critiquing a singer. Mariah Carey is famous for them — including that bit at the end of “All I Want for Christma-a–a-a-a-a-as…” which is playing everywhere this month. Just to give you some topics when you’re looking for ways to drop the word in casual conversation. And 1-across is the name of my parent’s dog, who was sitting on my lap while I wrote most of the puzzle, so that inclusion was a bit of an in-joke. Despite how we clued it, the actor in question will always be Jess from Gilmore Girls to me. My favorite Milo is the hero from The Phantom Tollbooth. It’s also a wonderful name for a dog.